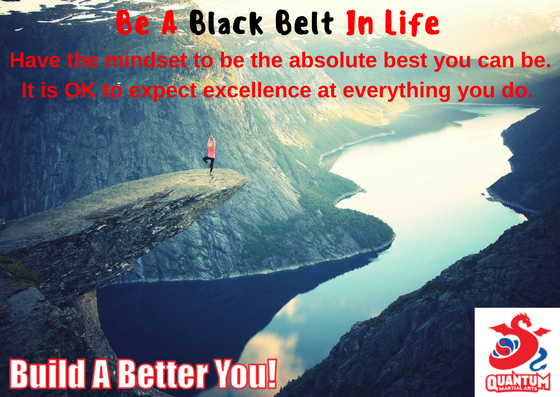 Are You A "Black Belt" In Life? It was (and sometimes still is) difficult juggling everything. I need family time, so that was a must. However, it used to get to a point where I was inadvertently doing shortcuts with my other commitments just to get my martial arts training in. I either was not spending enough time on them, or I was just not being efficient at them. I had already earned my Black Belt in martial arts. The Black Belt is a symbol of excellence. But is it OK to be a Black Belt in one area of your life but not in other areas? Not really. The Black Belt is more than just properly demonstrating techniques on a grading day. There are so many mental and emotional lessons that you must master before you even earn the right to go for your Black Belt. I came to realise for me to commit to my highest priorities, I had to become a Black Belt in those areas of my life. It was the only way. Mentally strong. You must be to maintain focus and discipline, no matter what. Are you neat and presentable for work, school, social engagements and even martial arts? Are you shaved? Do you smell good? Do you have a smile on your face? Do you do what you say you are going to do when you say you will do it? Personality under pressure. Anybody can have a Black Belt attitude when things are good. However, can you keep that attitude when things are not so good? No person is an island. You want to have fun and involve all of the important people in your life. Therefore, are you still spending quality time with your family and friends? Are you getting along well with your school mates or fellow staff? This is the most important point on the honesty factor. There are so many “commitments” in life that it is hard to keep up. The only way that you can keep up is to get better. And the only way that you can get better is to approach each task with a Black Belt attitude. Be the absolute best you can be. It is OK to expect excellence. If you apply the Black Belt attitude, you should not just expect excellence. You will deserve it! p.s. Make sure you keep martial arts as one of your commitments. Where else are you going to learn the Black Belt attitudes that will help you be excellent at everything you do? Martial arts is the gift that keeps on giving. p.p.s I love hearing success stories, as it inspires me to be better every day. So let me know how you have rated yourself on the above points. I will help you in any way I can to make sure you are a Black Belt in life.